Happy Spring! I'm definitely looking forward to the warm weather approaching. I'm also really looking forward to the upcoming summer edition of the National Stationery Show! Happy Spring! I'm definitely looking forward to the warm weather approaching. I'm also really looking forward to the upcoming summer edition of the National Stationery Show! How exciting to have not one, but two opportunities this year to participate in the NSS. The NSS's co-location with NY NOW was a win-win for exhibitors and attendees of both shows this past February and is sure to be a boom for these shows in August as well. August is a great time for most retailers to purchase additional gift and stationery products to fill their shelves for the all-important fourth-quarter selling season. As a buyer, this is your second chance to pick up items you might have missed at the last Show. For vendors, it's an opportunity to restock bestsellers you might have sold out of earlier in the year. So, save the date for the next NSS, taking place August 10-13 at the Javits Center in New York City. I promise the weather will be warm! David Pillard is owner of Tender Land Home – a sophisticated, rustic and contemporary home-goods store located in Phoenicia, NY, whose varied merchandise mix includes a great selection of giftware, greeting cards (many letterpressed), chic pottery, fragrant soaps and candles, luscious pillows, cozy rugs and more. 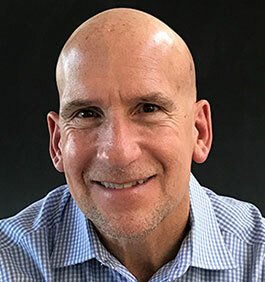 At last month's National Stationery Show, Pillard was a panelist for the seminar, "Top Tricks from Top Bricks," at which he shared information about what it takes to succeed as a brick-and-mortar store today. 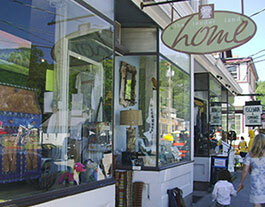 Here, he offers additional details about what makes his store, as its website states, the "best little gift shop in the Catskills." 1. My store is named after the opera "The Tender Land," with music by Aaron Copland. 2. 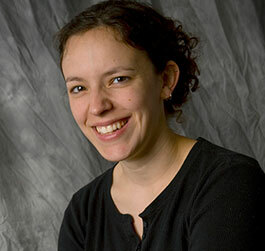 A few years ago, a woman came into my store after not having been in Phoenicia for decades. She told me that her roommate when she lived in the apartment over my store years ago was Debbie Harry of "Blondie" fame. They were both waitresses at a former hotel across the street from my store. 3. In this era of emails and instant messaging, I'm selling more greeting cards and notecard sets than I ever have. 4. Every May, the graduating class of the Woodland Playhouse Preschool paints a mural on the front of my store. It's a wonderful and very visible way to encourage early-age participation in the arts in my community. 5. My Facebook and Instagram postings of my canine friends who come to visit my store – my "doggies of the day" – garner some of my highest social-media audience engagement. 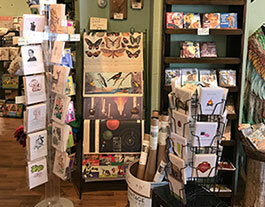 The store carries numerous card and stationery lines. 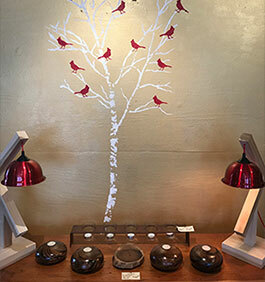 A wall stencil was done by owner David Pillard. Tender Land Home's owner David Pillard. What was your most ordered item at the recent National Stationery Show?? "Our most ordered item at the NSS was also our new product release for 2019. Our playful twist on the classic, informal flat notecard features our sweet and simple line illustrations, letterpress printed in fun colors and paired with colorful envelopes. Illustrations range from coffee cups (our bestseller) and bananas, to bicycles and llamas." — Shelley Barandes, Owner/Designer, Albertine Press, a letterpress print and design studio and paper boutique located in Cambridge, MA, selling cards, gifts and more for the paper obsessed. "Our most ordered product at the NSS was our flagship product, the "Self Journal." The Self Journal is a 13-week roadmap to help you reach your goals. The Self Journal is your accountability partner. You get the opportunity to hold yourself accountable with our monthly, weekly and daily pages. The 13-week goals cut procrastination and maximize productivity by keeping the end in sight. Daily gratitude, reflection and goal setting combine with 30-minute scheduling to keep you laser focused. 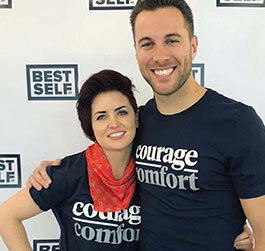 We have helped more than 200,000 people reach their goals with the Self Journal"
— Cathryn Lavery and Allen Brouwer, Co-Founders, BestSelf Co., an Austin, TX-based company created to provide everyday tools for people to lead a life of which they can be proud. The "Self Journal" 13-week journal from BestSelf Co.
"I was pleasantly surprised with the Show’s top-seller, "A good friend is one you can talk on the phone with. Even while you pee," because it’s one of my favorites but not the usual top-seller. Women love it because it's true, so they buy it for the best friends in their lives. The expression is one I've used for years and have a couple of friends I actually do this with – although I do mute the phone. Like many of my cards, they're relatable, yet unexpected." 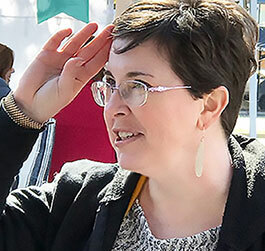 — Jennifer Hadley-White, Owner, Dry Wit Goods, a Ft. Worth, TX-based producer of greeting cards, calendars, prints and other gift items, whose tagline is: "Making Sarcasm a Business." "Our best-selling card at NSS was "Happy Birthday." This was our first birthday card and continues to be one of our best-sellers. What makes this card unique is the playful design and color gradients on each letter, which makes it stand out. Our customers really love touching and seeing our cards in person because of all the little details." 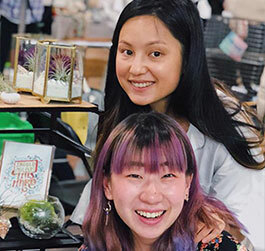 — Jasmine Le and Jessica Lin, Co-Founders, LETTERATI CO., a NYC-based stationery and design studio whose cards feature hand-lettering, watercolor designs, vibrant colors and quirky quotes. "Happy Birthday" blank card from LETTERATI CO. Considering our culture's current TMZ-fueled, 24/7 obsession with celebrities' lives, it's not a surprise that media stars and other well-known public figures – both past and present – are the latest popular subjects on greeting cards. Below are several that were seen at the winter edition of the NSS. 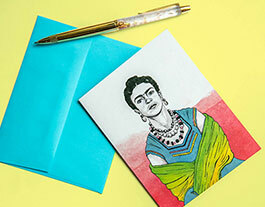 Blank card showing artist Frida Kahlo comes from Concept Fourteen. 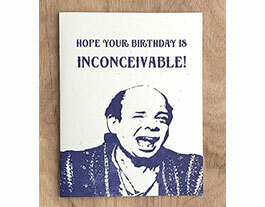 Letterpressed card with actor Wallace Shawn in "The Princess Bride" is from Guttersnipe Press. 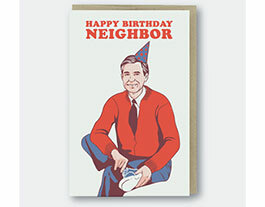 Birthday card featuring Fred Rogers, aka Mr. Rogers, is from Pike Street Press. 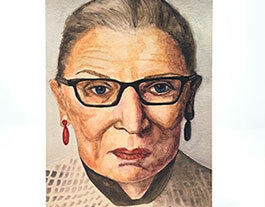 "RBG" is available as a greeting card or in a set of six flat notecards from Stefanie Demas. 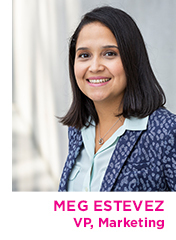 Many recent NSS exhibitors have generously shared their booth design plans, from concept to creation, to help exhibitors plan for a successful presentation at the NSS.